Now wondering if it may be possible to print the scanning pattern onto a disk. Maybe take an old hdd platter and imprint precisely angled indentations so that as the platter is spun it moves in both the x and y axis and of the hdd motor is used then it’s just a case of turning the laser on and off and taking the timing from the motor driver. Red, green, and blue lasers to get full RGB pictures??? Surprised no one uses those projection TV MEMS. Reminds me of the old Televisors. If you put a photocell adjacent to the laser, could you map the bounce angle vs incoming light and read the object you’re projecting onto? IF you could close that sensor loop, you could just stand in front of a white board, and draw with your finger where you want the laser light to put letters. 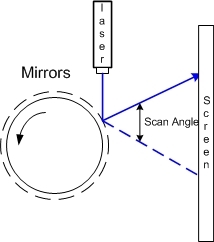 some LIDAR scanners do basically this — using a single laser, detector, and a spinning mirror to scan the laser across (usually) a single line, measuring time of flight to get distance. I think the mirrors are out of alignment! So the vertical resolution is the number of mirrors and the horizontal resolution is how fast you can pulse the laser? Would more mirrors mean you’d need to tweak your rotational speed and laser pulse rate to make up for the smaller area of each mirror? This seems like it might be a good candidate for RGB laser experiments. I think as long as the lasers are in the same vertical plane, they can draw over the same area based on when the laser is fired though the overall area the picture could be drawn on would be smaller than what any individual laser could draw on. If you use more mirrors, you will need to either increase the diameter of the wheel, or use smaller mirrors (and less sweep length). Or, you can use smaller mirrors and a lens to get the bigger sweep length again. If you make a large wheel with 325 tiny mirrors and a wide angle lens, you could project PAL. I guess it wouldn’t work anymore to use separate mirrors. A better way to go would be to use a really precise CNC machine to cut faces on a round piece of aluminium, at 325 different angles, then use vapour deposition to deposit aluminium. But the faces should be really precise and buffed to a shine. I have no clue how to reach that precision with diy stuff. maybe doing vertical and horizontal deflection separately would make the machining enough easier? Thanks for the new term, sweep length. I was trying to imagine how a smaller mirror would affect things. I’ll have to see if things like the speed of drum rotation, and position of the laser factor into that. I was also thinking about the use of multiple lasers to increase vertical resolution. But then I think you would need a way to align the beams in such a way so the apertures of the multiple lasers stay aligned at any distance. That seems to me like a pretty difficult problem to solve. However, those are all in line. In this project each mirror has a different angle in relation to the axis of rotation. It’s super cool to see an Arduino overclocked like that, but at that point, why not just use a Cortex-M0 board? FTA, “Why? No real reason” – fair enough! But these AVR cores are ancient – unless you’re relying on “plug-and-play” Arduino libraries, I don’t see what benefit you get from them over a Cortex-M chip. The core might run faster, but the interrupt latency is higher on ARM. Perhaps a Teensy 3.5 might be a little faster. 3D print a stack of rotors with angled faces to mount the mirrors. Stack lasers for more vertical resolution. Use red, green, and blue lasers with the mirrors angled to scan the same area to mix for full color. Old thermal imagers worked the opposite of this. They scanned the image field over a single point detector that created the image. This was before they learned to make microbolometer arrays.